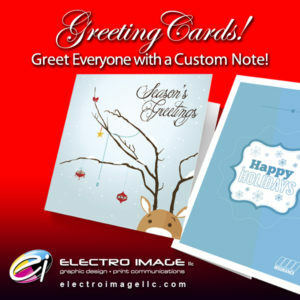 The later months of the year mark the beginning of the holidays and themed greeting cards lead the way in sharing a holiday message. As business owners, this is a great opportunity to reach out to clients and connections, but it’s also a simple way to maintain a professional relationship. Increase your touch points—did you know it takes eight or more ‘touches’ to convert a lead into a paying customer? Most of us rely on email and the occasional networking meeting to stay top of mind. 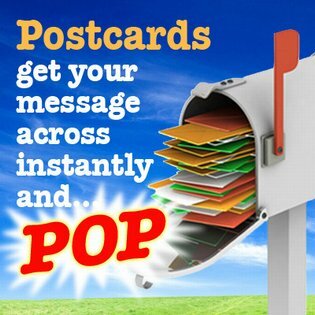 A greeting card with matching envelope will leave a longer impression on the recipient. Be sure to include your business card! 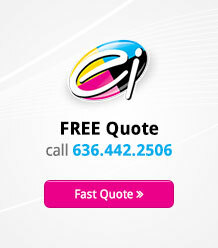 Direct mail conveys a little extra time and effort to reaching out to your contact; an action that is appreciated. They’re useful year-round, too. Share news such as anniversaries, build awareness for an event, or express thanks for their business. Greeting cards are never dull, either. Dress them up with silk lamination, Akuafoil, metallic finishing or vary the size. Maybe toss in a gift card. The possibilities will excite you and your recipients.